Yesterday, I came *this* close to being in Goa again. Being near a package sent to me by my family through a friend visiting/working in Seattle for a week was my escape and even though I’m not literally there, I can breathe the curry patta (leaves) that grow from my neighbour’s compound to our top floor balcony and drop a red chilli in hot oil whenever I feel low. The homesickness has been on the uptick lately. This is the time of the year when I have a plane ticket and I’m all prepared to say “See you sucker,” to the winter. That’s not on the list this year and so, packages of dried food with amazing labels made my mother will do. They are so professional. Airport customs has nothing on her. Olfactory memories are comforting. They’re even more special because they don’t come easily. You have to put in the work to sniff them out (yuk yuk). In the case of food, you have to cook. I say this a lot, in varied ways, and maybe I do it so I don’t forget – food keeps me close to my tiny home state. I usually end up hoarding the bags of presents I bring back from India but this time I won’t. I have a little project I started working on and these ingredients give me such a great headstart on it. THANK YOU FAMILY (for EVERYTHING) and Rhea (for the tamaatar/tomato fabric) and Prateek, for bringing all these things to me, which he handed out one-by-one in his hotel room. I felt like I was winning all the awards. If you’d like to hear more from me, I have a newsletter which comes out twice a month right now. Here is where you sign up. It will send you an email and once you confirm it’s you, you get more me. Yay. My food situation has been all about work lunches these days. I get a half-hour break at work and if I don’t eat, I have nothing else to do. This has me waking up early to make something for myself that will be fast and delicious. I’m glad I had my dad unknowingly drill it in our heads that cooking isn’t hard and chopping vegetables at 7.30 in the morning is perfectly reasonable. This fried rice with boiled eggs has been happening in variations depending on what I have in the fridge. 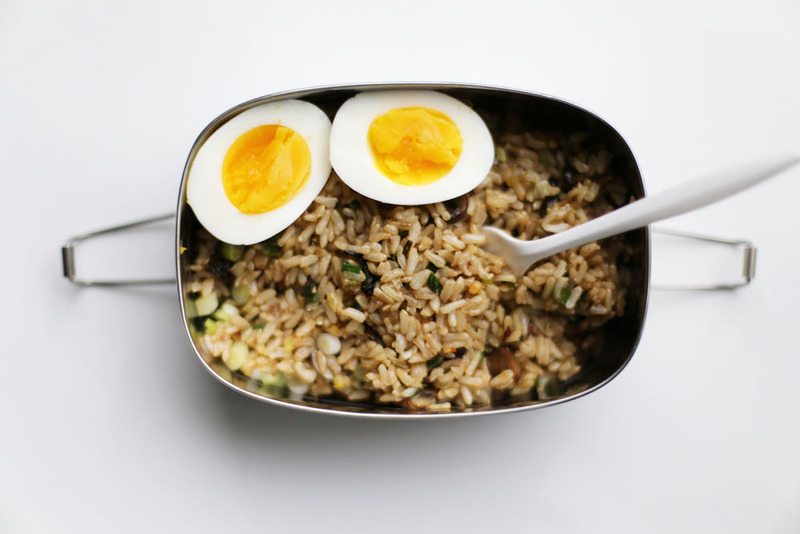 Fried rice is a v.v. popular Indian street food, thanks to our Chinese immigrant community. Through cultural sharing, India has its own version of Chinese food and depending where you go in the country, you’ll see minor differences in how its cooked. For example, curry leaves in fried rice are totally acceptable. I tried it in this recipe but it didn’t stand out for me so I’ve left it out of the list. 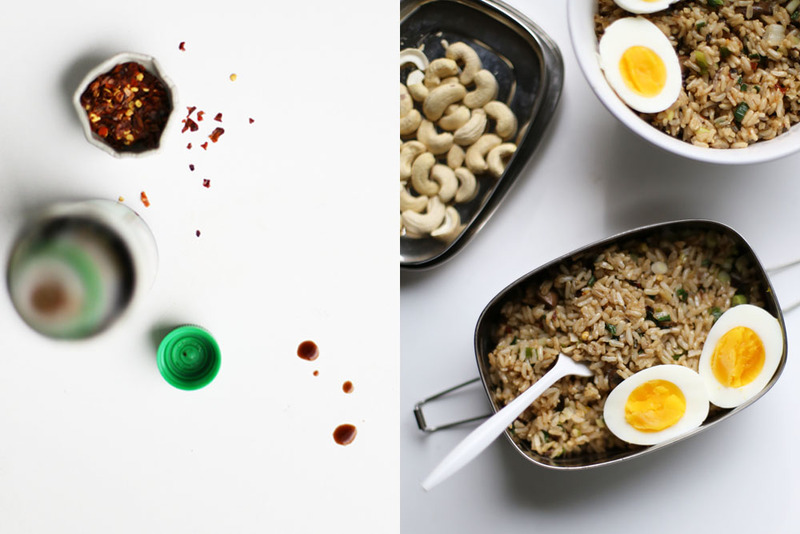 Fried rice tastes best when made with day-old rice that has sat in a cold fridge. Use any type of rice or grain you like and other vegetables or meat protein work too. This is what I had in the fridge today. I had tofu too but I forgot about that. Disclaimer: The eggs in the photos are not 7 minute eggs because I didn’t cool them quick enough. That said, they were still good and I ate mine happily. 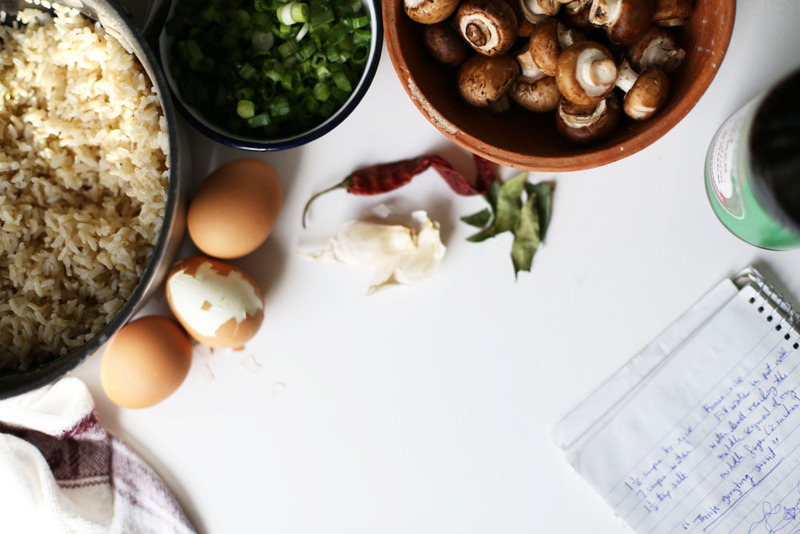 Add the rice to a medium-sized pot with a lid and rinse + drain once or twice. Don’t worry about draining the water down to the last drop. It’s okay if there’s a little left behind. Also, if the pot you’re using doesn’t have a lid, I’ve found a similar-sized salad plate or an overturned frying pan can help. Cover the rice with water at a depth of 2 inches over the surface of the rice. An easy clue on how to estimate this is by dipping your middle finger into the water. If the water reaches the second joint/segment on your finger as it is resting on the surface of the rice, you’re good to go. You can’t have too much water unless the pot is overflowing. In that case you will need a bigger vessel. Put the pot on the stove on the highest heat setting, add the salt and bring to a boil. Once the water is furiously bubbling, turn it down ever-so-slightly but make sure it’s still boiling. Set a timer for 30 minutes and let the rice boil uncovered for this time. Keep an eye or ear on it. If you hear it making a thick gurgling sound, you might need to add 1/2 cup more water. At the half-hour mark, carefully drain the rice through a large kitchen strainer or colander and pop the grain back into the pot. Cover with a lid and let it steam for 10 minutes on the kitchen counter or on the stove (on a burner that is off and at room temperature, if electric). Fluff with a fork and it’s ready. Add enough water to a pot to submerge four eggs completely. Bring the water to a boil on high heat and very carefully lower the eggs into the water making sure you bring them to rest on the bottom of the pot. Set the timer for 7 minutes and let the eggs cook. As soon as it beeps, take the pot off the stove, drain the water and run cold water all over the eggs to make them stop cooking. If it helps, have a bowl of ice water ready. Peel the eggs, discard the shells and set them aside in a bowl. Place a large frying pan on the stove on medium-high heat and add the oil to it. Let the oil get hot and then add the dried red chilli to it. It should start sizzling as soon as it touches the pan. Fry for 30 seconds and then add the garlic and green onions to the pan. Stir constantly until the onions turn brighter green and get fragrant, for about 1 minute. Add the mushrooms to the pan and stir for another minute or two, until the mushrooms lose their stiffness just a tad. Turn the heat up a little bit. Add the rice to the pan and combine with the onions and mushrooms. Stir-fry the rice, spreading it out and letting it sit flat for 10 seconds at a time. This will let it stick to pan as you stir. Cook for 3-4 minutes. Take the pan off the heat and add the soy sauce. Taste and add more soy sauce or salt, if you prefer. 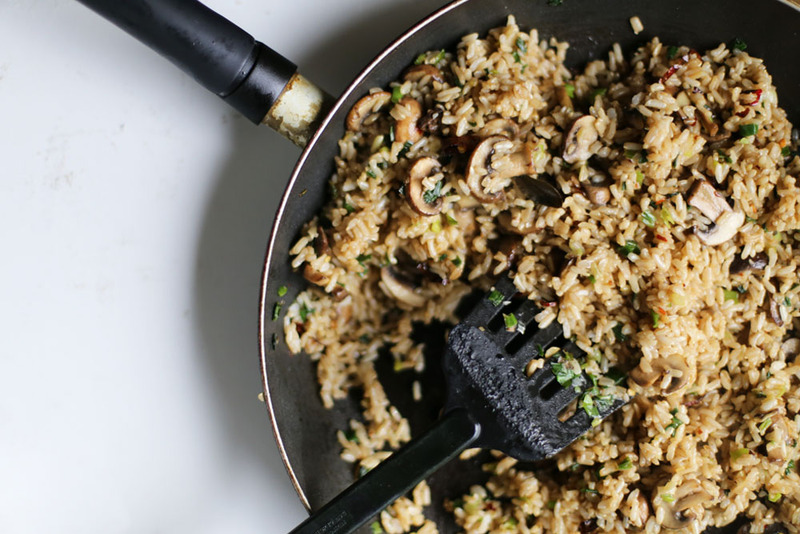 Find the dried red chillies in the rice and chop them on a cutting board. Toss them back into the fried rice. 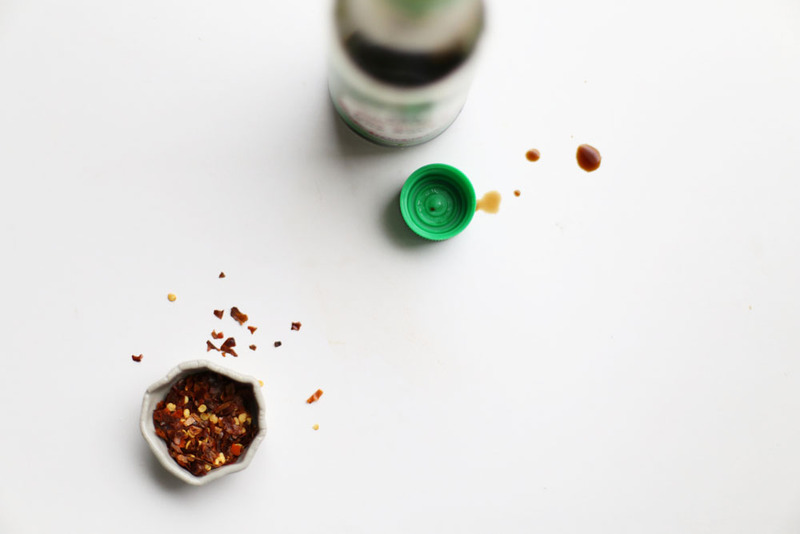 If you’ve chosen to just use red pepper flakes instead of whole chillies, add some in at this point. Double or nothing for me. 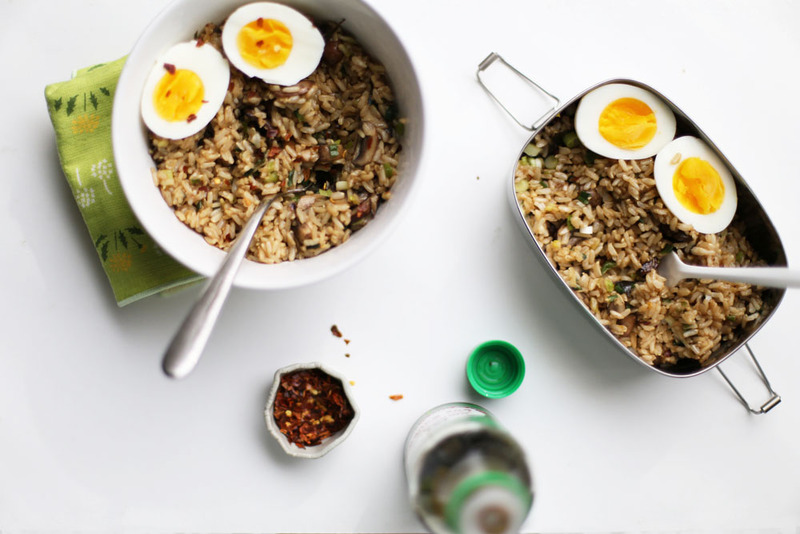 Spoon the rice into bowls, cut the boiled eggs in half over the rice (yolks will be slightly runny) and eat. Ha! Tonight I made a kind of kedgeree which I explain to the uninitiated as Indian fried rice with salmon! Fry up onion and garlic with curry paste/curry powder/chilis add assorted chopped veg like carrots, peppers, green onions, celery, kale, cabbage or peas and cook til soft. Add cooked day old rice and canned salmon (usually half a can per person) or smoked salmon or cod. Heat up til steamy. Sprinkle with chopped cilantro or mint and salt to finish and squeeze over some lemon or lime juice if you like. Serve with fruit chutney. Oh my goodness, Ruth. It is my new mission to make this. Thank you for teaching me something I didn’t know.